Charlotte Street is a contemporary Cornish artist. Her paintings are inspired by the colour and light of the seascapes and landscapes of Cornwall, Isles of Scilly and Gower. The original artwork displayed on this site is available for purchase direct from Charlotte Street or from the exhibiting galleries. Please contact us for further details. 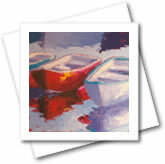 All of the paintings displayed in the galleries section of this site are available as high quality, printed greeting cards. Original artwork by Charlotte Street can be found on display in a number of galleries and exhibitions around the UK.